On March 11, 2011 magnitude-8.9 earthquake hit off the shore of Japan, unleashing a 23-foot (seven-meter) tsunami and leaving enormous destruction in its wake. Hundreds have been killed in this disaster and thousands have been left homeless, as the tsunami swept through, causing mass destruction and setting off widespread fires that burned out of control. I have created this fundraising page to aid with the enormous relief efforts that is urgently needed. I picked ShelterBox USA because I know that money will flood into the RedCross who will have the capability to do their part. ShelterBox UK was one of the first relief organizations to respond the crisis, members of the organization were on the ground less than 24 hours after the Quake. ShelterBox is an international disaster relief charity that delivers emergency shelter, warmth and dignity to people affected by disaster worldwide. Each box supplies an extended family of up to 10 people with a tent and essential equipment to use while they are displaced or homeless. 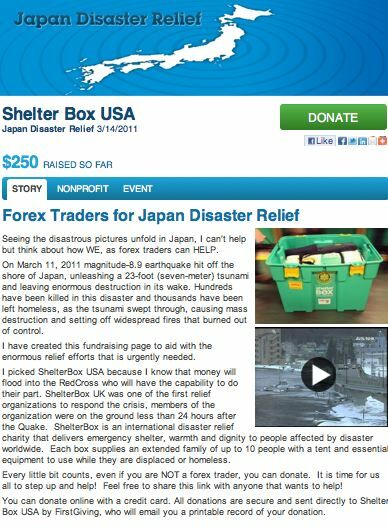 Every little bit counts, even if you are NOT a forex trader, you can donate. It is time for us all to step up and help! Feel free to share this link with anyone that wants to help! You can donate online with a credit card. All donations are secure and sent directly to Shelter Box USA by FirstGiving, who will email you a printable record of your donation.